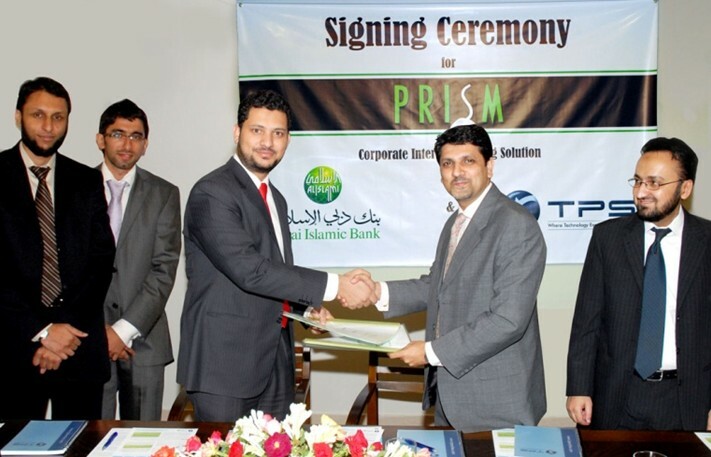 Dubai Islamic Bank Pakistan Ltd., has signed a deal with TPS for ‘PRISM – Corporate Internet Banking Solution’. Offering a wide range of online banking and cash management services, TPS provides businesses with real-time technology and rigorous security in a versatile, yet simple-to-use application. The signing ceremony was attended by high level officials from TPS, DIBPL and media personnel. The phenomenon of Online banking for corporates is relatively new in the Pakistani market, making DIBPL one of the leading banks in the industry to offer this service. With PRISM’s powerful features and well structured user experience, DIBPL’s customers would have the convenience of 24/7 online services that will enable them to undertake complex financial activity, meeting the demands of the modern enterprises and corporate groups. In addition to a comprehensive back-office, a combination of multiple levels of security has been embedded in PRISM knowing the sensitivity of information and security threats posed to online banking. The services include powerful payments and reporting tools that will provide maximum convenience and control to DIBPL’s corporate customers. “After a careful evaluation, we have chosen TPS as a company and PRISM as its Online Banking Product offering everything that DIBPL is looking for to ensure the success of this strategic initiative.” commented Ammar Bin Mujeeb, Head of Information Technology Division, Dubai Islamic Bank. “TPS feels privileged to be associated with DIBPL as a trusted technology partner for its Internet banking initiative and will enthusiastically work towards the realization and successful implementation of PRISM. “Shahzad Shahid, Global Head – Business Development, TPS.